In the spirit of bands like the secret Ghost, makes "TheThousanfold Epicentre" an album with influences of the 60 - 70s psychedelic rock and the 70s prog rock and at the same time they do it with a different and new touch. They lead us into a dark labyrith with music and lyrics where they worship the dark lord. My first contact with artists who flirts with the dark side was with the trio Venom, but this sounds nothing like that. This is done with finess and a depth in the music. With a female singer with a clear and high voice that actually sings with conviction in the songs result in tracks that are tight and have a solid wall of sound with a black mysticism that may seem attractive to those who are called. TDB has their own sound and that is a rare phenomen nowadays, and it's wrong to call it Classic Metal, I'll rather names it Vintage Classic Rock or just Psychedelic Rock with high instrumental technical knowledge with dark lyrics. The melodies are well structurated and the production is top class, but I'm not convinced that this is an album for all fans of heavy metal or Hard Rock, but fans of the psychedelic rock genre must earmark this to their music collection. 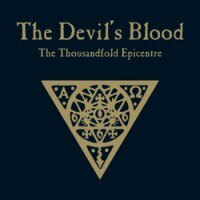 "The Thousandfold Epicentre" is overall an interesting music journey and I have to admit that it's a exiting band with big values for the future. Hope to see them on tour this summer. Best tracks: "The Thousandfold Epicentre", "Cruel Lover" and "Fire Burning".